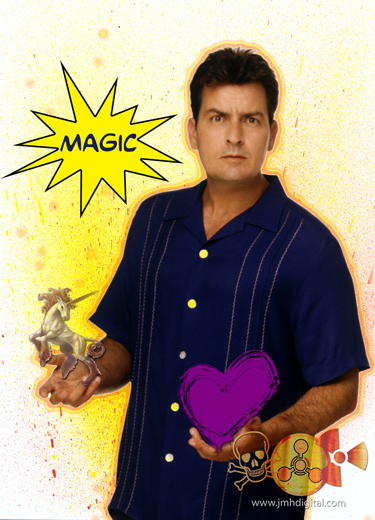 As you may have all heard that Charlie Sheen's Show "Violent Torpedo of Truth/Defeat is Not an Option Show" is not as magical as everyone would have hoped. Hard to believe I know, but the truth will set you free or freak you all out. In honor of Charlie, I will be commenting in Crazy talk... Yeah, not one thing will make sense... so if I get the chance I will be leaving gold as a comment... I think for the entire month of the A to Z blog-fest. Ps. I am also enjoying your post! Good to meet you via the A to Z challenge btw. I heard about that! I think it was somewhat expected. Don't go drinking too much of that tiger blood. Heard it sucked! What do people expect for $80? I did the entire P90X workout, stopping only to change the CDs. Winning! Oh, dear. Poor Charlie Sheen. Someone needs to sort him out! I like zombies, too- at Halloween. Your blog is so crazy that its cool! Can't wait for the horrors that await me through this alphabet! I love those critter pics! Ah Charlie, what a lunatic. Looking forward to reading your crazy comments around the blogosphere. you all are "winning" in your own way... and this is a good thing! Oh Charlie Sheen...will we ever get tired of mocking him? No. No we won't!